In this interview, Vladimir Putin says his baptism was kept secret from his father, who was a member of the Communist Party. His mother took him to be baptized at the Transfiguration Cathedral in Leningrad at the end of 1952. Putin says the priest suggested giving him the name Michael, but Putin's mother insisted on the name Vladimir. Later, speaking with Patriarch Kirill, Putin asked him how he came into the Church. Kirill said that his father served as a priest in Leningrad in the Transfiguration Cathedral, in the 1950s. Putin asked whether there were any other priests named Michael serving there during that time. Patriarch Kirill said his father was the only one. 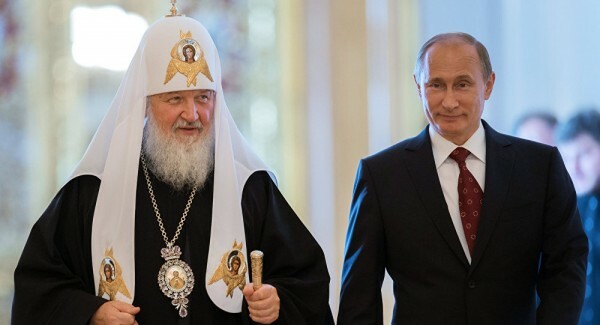 Thus, Vladimir Putin explained that Patriarch Kirill's own father is the one who had baptized him as a child.